FRISCO, Texas — As the second wave of NFL free agency begins this week, the Dallas Cowboys are showing signs of life. Wide receiver Randall Cobb and safety Clayton Geathers were at The Star for visits on Monday and potentially could sign deals that will tend to be more team-friendly than the player-friendly contracts that were doled out last week. That is how the Cowboys mostly want to operate in free agency: Work the fringes, strike if a deal presents itself and let other teams overpay. 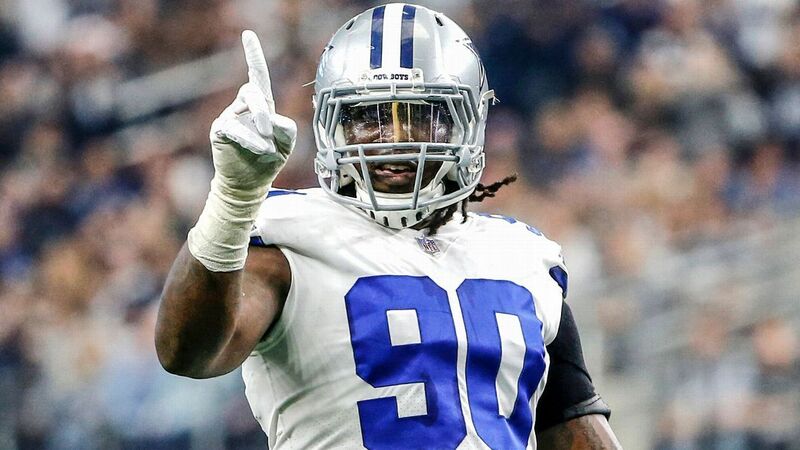 There is another reason why the Cowboys want to work free agency that way, and it was their stated goal before the frenzy began: They want to keep their own players, such as DeMarcus Lawrence, Dak Prescott, Amari Cooper and Ezekiel Elliott. But that’s where the first wave of free agency (or big trades) can affect the Cowboys’ approach — the contracts given to Le’Veon Bell, Antonio Brown, Nick Foles and Trey Flowers can impact Dallas, too. Flowers’ new deal: Five years, $90 million, $56 million guaranteed from the Detroit Lions. The Cowboys put the franchise tag on Lawrence for the second straight year, which would pay him $20.5 million in 2019. There have been discussions about a new deal since the Cowboys put the tag on Lawrence, but hurdles remain before a long-term extension is signed. Flowers’ deal checks in at $18 million per year — great money for a pass-rusher who has never had more than 7.5 sacks in a season. In three of his five seasons, Lawrence has recorded at least eight sacks, including 25 in his past two. The Flowers deal shows you what Lawrence could command if he were on the open market. He would be right there with Khalil Mack‘s $23.5 million average from the Chicago Bears. Though the franchise tag limits his leverage, he can still be the second-highest-paid edge rusher in the NFL with a deal that averages at least $20 million, if not $21 million, per year. Foles’ new deal: Four years, $88 million, $50.125 million guaranteed from the Jacksonville Jaguars. The deal can max out at $102 million. The $22 million average for Foles would be something the Cowboys could do for Prescott tomorrow, but they know better. The guaranteed money is about 57 percent of the deal, which would fall in line with what the Cowboys would want to do as well. Age is a factor here, too. Prescott turns 26 in July. Foles just turned 30. Foles was contemplating retirement before returning to the Philadelphia Eagles, and then he went on the mother of all playoff runs, winning Super Bowl LII. He then stepped in for an injured Carson Wentz in 2018 and led the Eagles back to the playoffs. Prescott has two playoff appearances in three seasons. He has 32 wins in three seasons. He has yet to throw for 4,000 yards, but that is not his game and it is not how the Cowboys want to play. The key for a Prescott contract will be building off the $2 million base salary he is set to make in 2019. In new money, Prescott is looking at a contract that will average more than $25 million a season, which is why getting something done (six or seven years) with him before the season starts is so important. Brown’s new deal: Three years, $50.125 million, $30.125 million guaranteed from the Oakland Raiders. The deal can max out at $54.125 million. This is not a straight apples-to-apples comparison because Brown, 30, was traded by the Pittsburgh Steelers to the Raiders. For the trade to go down, Oakland knew it was going to have to adjust Brown’s contract. When the Cowboys made the trade for Cooper, they knew they would have to sign him to an extension, too. You do not give up the security of a five-year deal with a first-round pick for a 25-game rental. Odell Beckham Jr. is the highest-paid receiver at $18 million per season. The Chiefs were willing to pay Sammy Watkins $16 million per season last year in free agency. Cooper’s production and his importance to the Cowboys’ offense starts at $16 million a year on an extension. He is set to make $13.9 million in 2019 on the fifth-year option. Brown’s deal checks in at $16.7 million, but Cooper, 24, is seven years younger. Cooper’s deal should fall between the range of what Brown and Beckham are making and could happen during training camp. Bell’s new deal: Four years, $52.5 million, $35 million guaranteed from the New York Jets. The deal can max out at $61 million. Bell opted to sit out last season and not play on the franchise tag with the Steelers for a second straight season, passing on $14.5 million. While he did not put any wear and tear on his body by sitting out, he did not cash in the way some would have expected at $13.125 million per season. Todd Gurley got $45 million guaranteed last summer in his deal with the Los Angeles Rams. The Cowboys know Gurley’s deal is the basis for any deal with Elliott. Cowboys executive vice president Stephen Jones said as much from the NFL scouting combine, but the question will be when Dallas begins the process of working on the contract. There has been a report that Elliott would consider holding out this season for a contract extension; however, he already has voided the guarantees in his contract and he missed six games in 2017 because of a suspension. Would he really forfeit more money? It would be perhaps a bigger gamble than the one Bell took.